What are the issues facing refugee resettlement? This fall, the 73rd General Assembly of the United Nations (UN) was held in New York. The 193 UN member states gather annually to discuss, and sometimes act upon, global issues. Refugees were on the agenda in 2018, not only because numbers are historically high (25.4 million at the end of 2017) but also because the United Nations High Commissioner for Refugees (UNHCR) was there to present its proposal for a Global Compact on Refugees (GCR). The GCR results from a two-year process that began with the adoption of the New York Declaration in 2016, led by UNHCR. The final GCR draft lists three main focus areas for refugee protection: reception and admission; meeting needs and supporting communities; and solutions. The GCR builds on the three traditional durable solutions to refugees - local integration, voluntary repatriation and resettlement - and adds other local solutions and complementary protection to the fold. Resettlement is dealt with in paragraphs 90 to 93 of the GCR and is presented as a mechanism of burden- and responsibility-sharing. Yet it is unlikely that the resettlement commitments put forward in the GCR will significantly change how resettlement is used globally, in spite of increasing resettlement needs. 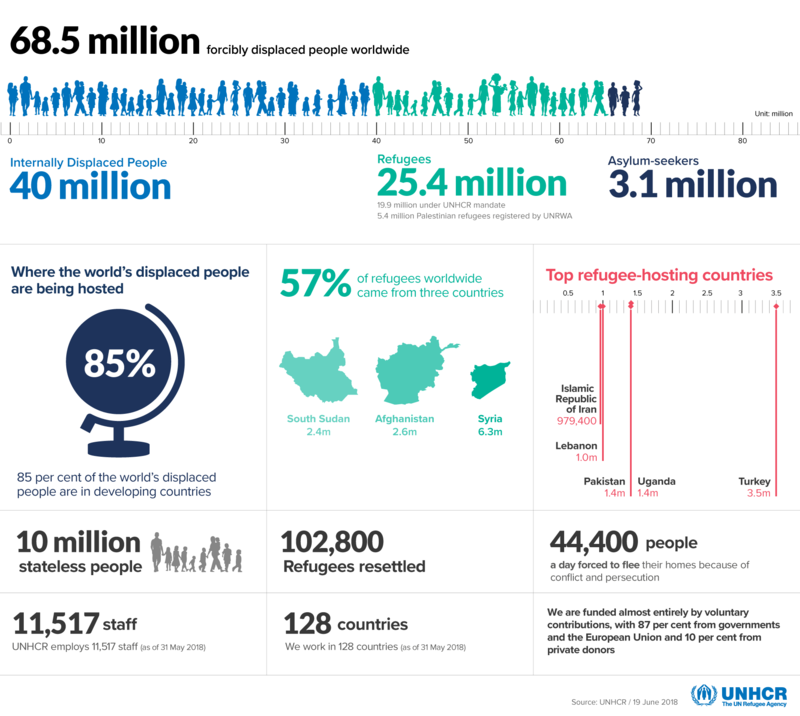 Refugee resettlement is only considered and used by UNHCR and states as a durable solution to forced displacement for a minority of refugees, with 1.19 million refugees in need of resettlement in late 2017, up from 691,000 in 2014. Still, only a fraction of resettlement candidates are resettled annually - in 2017, 65,109 were. Worryingly, the last two years have witnessed a significant downward shift in the offering of resettlement places, with a global drop of 54% in 2017 and a considerable decline of resettlement in the US under the Trump Administration. As we argue in our new edited volume, Refugee Resettlement: Power, Politics and Humanitarian Governance, the limited availability of refugee resettlement, as well as annual variations in resettlement numbers, can be attributed to power dynamics at the core of refugee resettlement. We use a broad definition of power that encompasses forms of power over others, such as coercion and authority, as well as power with others, such as persuasion and negotiation. Contrary to the right of asylum, refugee resettlement is not codified in international law. Resettling refugees is entirely at the discretion of resettling states. No other actor has the power to override state authority in the offering of resettlement places. Therefore the GCR, which is a non-binding UN document, cannot impose the expansion of resettlement upon states. It is in this context that the very modest resettlement aspirations of the GCR have to be understood. For instance, there is no demand to set a global target of resettlement places. A resettlement target had in fact been suggested by civil society in the lead-up to the adoption of the New York Declaration, but this target was not included in the Declaration. Still, some of the GCR’s resettlement demands are less vague than the relevant sections of the New York Declaration (sections 77 to 79). The GCR promotes the adoption of a three-year strategy to expand the pool of resettlement places, as well as the adoption of specific targets in regards to elements of the resettlement caseload to be submitted by UNHCR to resettling states. In doing so, it refers to regional agreements, capacity building in new resettling states and a stronger involvement of private actors. In addition, the GCR recommends that resettling states admit at least 25% of resettlement submissions made by UNHCR within 6 months of a UNHCR referral. It also advocates for at least 10% of states’ resettlement caseload to be set aside for cases deemed urgent by UNHCR, and for resettlement to be used strategically. The setting of these firmer targets can be considered to reflect UNHCR’s power to persuade new states, as well as private actors, to engage more strongly in resettlement than in previous decades. Since the 1990s, UNHCR has expanded its efforts to persuade states to resettle particularly vulnerable refugees by developing guidelines regarding vulnerable refugee categories. These can be seen in the UNHCR Resettlement Handbook and in the GCR, with reference made to women and girls at risk and persons in protracted situations. This focus in refugee resettlement on the most vulnerable refugees has led us, in our edited volume, to label refugee resettlement as an instrument of humanitarian governance: ‘humanitarian’ because of its emphasis on helping the most vulnerable, and ‘governance’ given that a range of actors are involved in resettlement practice beyond states. Focusing on the most vulnerable implies an ethics of care, yet there is also a danger that the rights of those who are the recipients of humanitarian governance are neglected, as priority is given to saving lives rather than preserving human dignity and autonomy. There is also often very limited accountability for humanitarians towards refugees, and resettled refugees face significant socioeconomic barriers in resettling states. The imbalance of power to the detriment of refugees throughout the resettlement process can be daunting. It is important to note that the GCR makes references to human rights treaties, though it does not use much rights-based language in its resettlement-focused paragraphs. A more assertive human rights-focused language would be welcome, as it is likely that the current decline of resettlement places will not be reversed in the near future, as mentioned above. In addition, the decline of resettlement places could have a negative impact on the autonomy and rights of resettlement candidates and resettled refugees. One can only hope that local mobilization in resettling states will generate more political willingness to open new avenues of resettlement in the future, and that UNHCR can be an agent of change in this context. In light of the challenges discussed here, this would mean a significant transformation of the power dynamics at the core of refugee resettlement within states, among states and in the international community more broadly. Welfare systems and immigration: How are they linked in Europe?